Prices for the P1 are not quite out of control, but they're on their way. When the last US-spec McLaren P1 crossed the auction block a little over a year ago, its $2.09 million price tag made it . Only 375 units of the 903-hp hypercar were ever made, priced at $1.15 million at launch, and now an example has been snapped up at last weekend’s Amelia Island Concours for a record price of $2.39 million. Finished in a stunning shade of “Professor 2 Blue” with red accents and custom matte black and silver alloys, the P1 was delivered in 2015 and has had one owner from new. 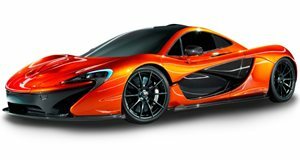 Aside from the meticulously detailed paint work, the most expensive McLaren P1 in the world is also just one of two models to come with specially molded seats – designed to mimic the Ferrari 365 GTB/4 Daytona. The original owner also optioned his P1 with a passenger side vanity mirror with the words “you look beautiful” etched into it, doubtless earning him plenty of bonus points with his other half. The previous owner also pledged all of the $2.39 million from the sale to his alma mater, the Rose-Hulman Institute of Technology in Indiana. Among the host of seven-figure cars to be sold at the Florida auction was and a $7 million classic Bugatti.